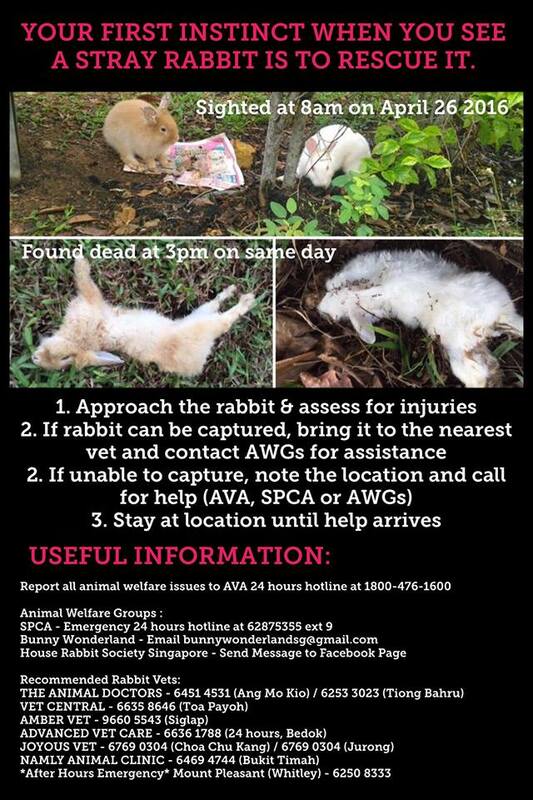 WHAT TO DO WHEN YOU SIGHT AN ABANDONED RABBIT? This morning we posted about the successful rescue of Cupcake. The spotter stayed at location until help arrived. Unfortunately, not every case is successful. The photos in this poster were from a case that happened in Sembawang Park. The spotter sighted 2 rabbits at 8am, took photos and walked away. By the time our volunteers arrived, both rabbits were attacked and died. We hope that everyone is well-informed on what to do when an abandoned animal is sighted. It’s a life in a danger and not to be left alone. AWGs are always here to help but we are not full-time staffs and do require the community to support. Our authority should also be informed to reinforce the severity of animal abandonment. Abandonment is an act of cruelty and it is the duty of the country and its people to protect our animals.